35 mn of ambiant electro sound. 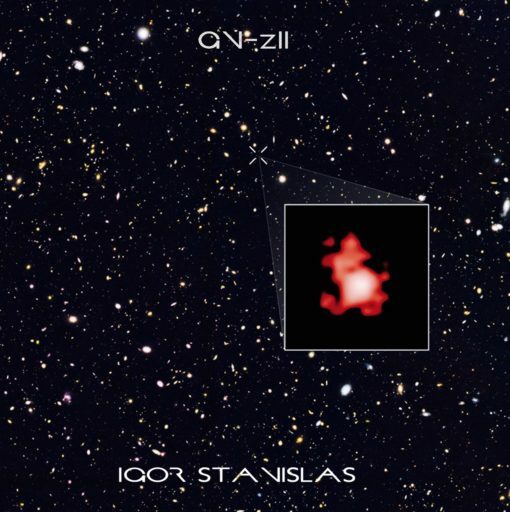 GN-z11 is a high-redshift galaxy found in the constellation Ursa Major. GN-z11 is currently the oldest and most distant known galaxy in the observable universe. GN-z11 has a spectroscopic redshift of z = 11.09, which corresponds to a proper distance of approximately 32 billion light-years (9.8 billion parsecs). [note 1] The object's name is derived from its location in the GOODS-North field of galaxies and its high cosmological redshift number (GN + z11). GN-z11 is observed as it existed 13.4 billion years ago, just 400 million years after the Big Bang; as a result, GN-z11's distance is inappropriately reported as 13.4 billion light years, its light travel distance measurement.